The History of the Battle of Fallen Timbers including details of the cause, reason, and summary. The dates and years of the Indian Battles and when and why the battle was fought. Battle of Fallen Timbers Summary and Definition: The Battle of Fallen Timbers was a conflict fought on August 20, 1794 in Northwest Ohio at the rapids of the Maumee River near the present Toledo. The Battle of Fallen Timbers was fought between the Western confederacy of Native Indian tribes led by Blue Jacket and the 1794 American Legion led by General “Mad” Anthony Wayne. The American Legion was commanded by General “Mad” Anthony Wayne’s force which consisted of 1,700 “regulars” and 1,500 members of the Kentucky Militia whose aim was to build a series of forts between the Ohio and Maumee rivers. 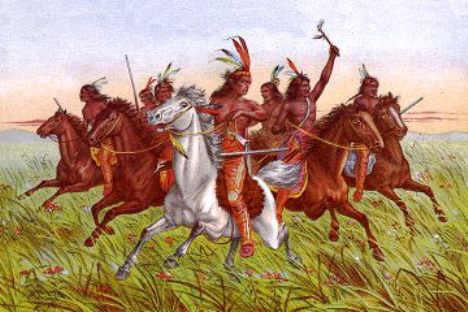 Nearly 1,000 warriors of the Native Indian confederacy, led by the Shawnee Chiefs Blue Jacket and Tecumseh, the Miami war chief Little Turtle and the Delaware (Lenape) Chief Buckongahelas were waiting to ambush the Americans. The Native American Indians sought camouflage among a stand of trees that had been recently felled by a tornado, hence the name, the Battle of Fallen Timbers. Less than 100 men on each side died in the brief Battle of Fallen Timbers, but the American Legion’s victory marked a major turning point in the fight for the western frontier. The American victory at the Battle of Fallen Timbers led to the signing of the Treaty Greenville in 1795. 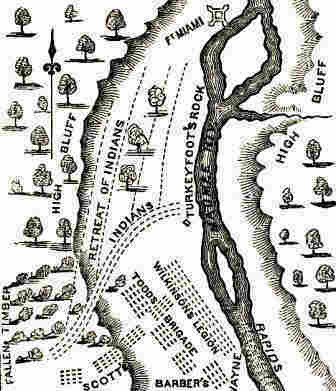 The illustrated Map of the Battle of Fallen Timbers illustrates the position of the combatants on the battlefield. The Native Indians were waiting in ambush amongst the fallen timbers created by a tornado and their line of attack. The position of Major General Wayne's well trained troops are shown on the Map of Fallen Timbers and the positions adopted by commanders Wilkinson, Todd, Scott, Barber and Wayne himself. Following their defeat at the Battle of Fallen Timbers the Native Indians fled the Americans and sought refuge at Fort Miami which was a British fortification. The British refused to shelter the Indians. 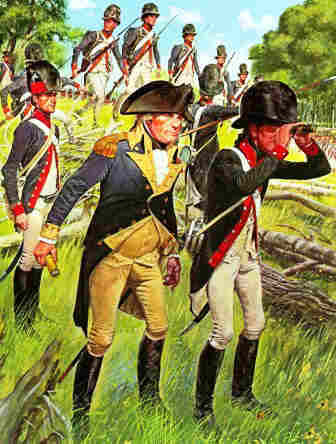 1791 General Anthony St. Clair’s American troops in 1791 by the Native American federation under Chief Little Turtle. 1792 General Wayne started training his troops in Pittsburgh. 1793 General Wayne's American Legion moved on to the Cincinnati region in the summer of 1793, awaiting orders. Negotiations were in progress with the Native Americans. 1793 Autumn 1793: The negotiations failed. The United States refused to ban any settlement by its citizens beyond the Ohio River and the Native Indians refused to allow intruders on their territories. 1793 September 11, 1793, Wayne received word to build a series of forts between the Ohio and Maumee rivers and quell the Native Americans. The expedition was planned for the spring of 1794. 1793 Wayne and his troops established their base at at Fort Jefferson and went on to build Fort Recovery. Battle of Fallen Timbers. Discover the key years, famous people and events of the Battle of Fallen Timbers together with the causes and effects of the Battle, conflict and battle. Pictures have been include wherever possible which show the battlefield, clothing and weapons of the Native Indian tribes and their leaders who fought in the Battle of Fallen Timbers. The illustrated text provides a really useful educational resource for kids and children of all ages. We have included pictures and videos to accompany the main topic of this section - Fallen Timbers. The videos enable fast access to the images, paintings and pictures together with the information and the many facts featured on this subject of the Battle of Fallen Timbers.